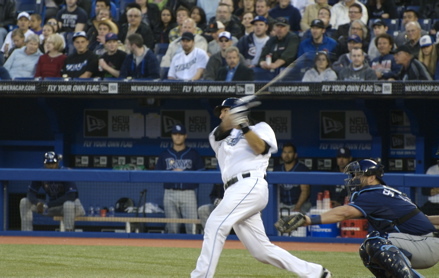 JP Arencibia homers for Ryley James Martin on Thursday. J.P. Arencibia not only made his good buddy Ricky Romero a winner on Thursday night, he got us all to remember winning on the diamond isn’t everything. 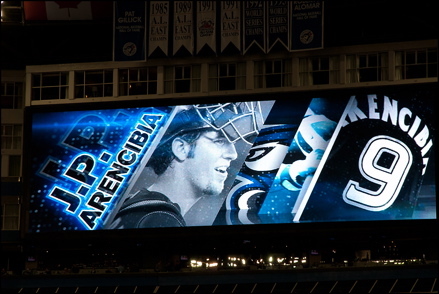 Arencibia and Romero dedicated the Jays’ 3-2 victory over Tampa Bay to Ryley James Martin, a 2½-year-old Oshawa boy who passed away on Wednesday after battling leukemia. Arencibia and Romero had met Ryley on April 2 for 15 minutes when he had the chance to visit the team in the dugout at the ’Dome. After hitting a two-run, seventh-inning home run off of Tampa Bay starter Wade Davis, Arencibia cried. The Boston Marathon is on Monday, the Blue Jays may have been prepping. They did their best impersonation of Forrest Gump on Sunday, running without care and for no particularly reason it seemed. With none out in the seventh, Travis Snider was picked off when he was caught leaving first base early on a Juan Rivera line drive that was caught by Red Sox second baseman Dustin Pedroia. An inning later, Corey Patterson — who’s done some terrific things since coming off the DL — was caught stealing third with two on and one out. Never mind that the Jays scored their only run on a double-steal in the second. Mistakes are mistakes and these ones were costly. Of course, you could also say it wouldn’t have mattered if the Jays ran up and down New England in game three of the series. Jon Lester (1-1) wasn’t going to give them much. He went six innings before leaving with a 6-1 lead at Fenway Park. 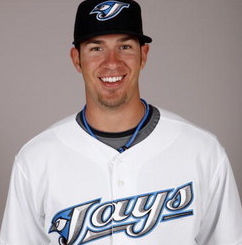 J.P. Arencibia had a decent day at the plate, bouncing back from an 0-for-4 perfomance on Friday — his last start. 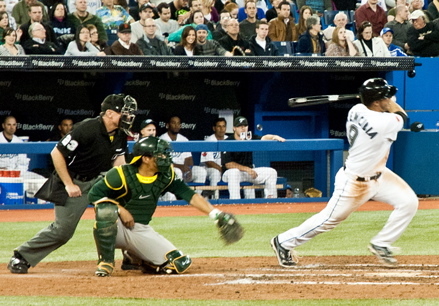 The rookie catcher went 2-for-4 and got his average (.308) back over .300, but defensively he was charged with two passed balls as the miscues mounted for the Jays (7-8). For the second straight day they managed just one run and have to be concerned that they’re the ones who’ve given Boston a pulse. The Red Sox (4-10) have won two games in a row for the first time.